Sheel took the image using a Nikon D3300 and Sigma 18–35 f/1.8 Art lens with a Hoya Red Intensifier Light Pollution filter. He stitched 12 shots for the foreground panorama. The foreground images were taken at 18mm, f/1.8, 1/3 second, ISO 100mm during the blue hour. 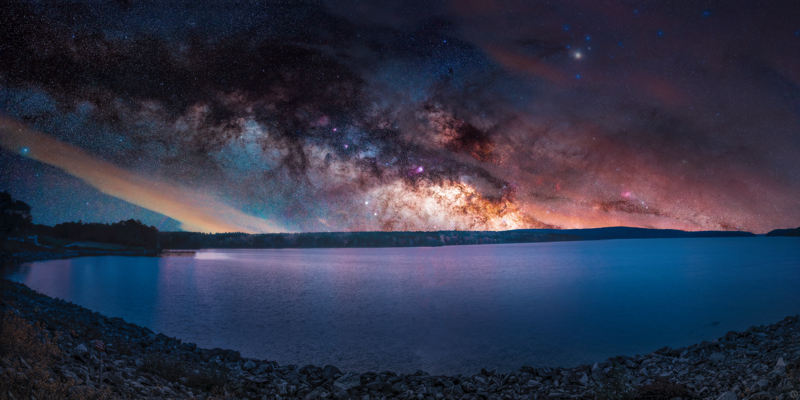 For the background, he stacked 6 panoramas and used a sky tracker to track the Milky Way. Each sky photograph was taken at 18mm, 240 seconds (tracked), ISO 1600. He has also put a lot of effort in color dodging and burning to bring out the star glow, H-alpha signals, and more. This image is a perfect example of how small the earth is in a giant universe. This is a magnificent image which show the result of much planning and masterful execution. Congratulations Varun.